President-elect Donald J. Trump has reportedly chosen Elaine L. Chao, the former Secretary of Labor under George W. Bush to head the Department of Transportation. Chao is married to U.S. Senator Mitch McConnell (R-Kentucky). 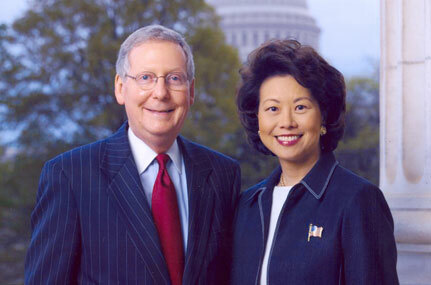 Chao’s family has given money to her now-husband Senator McConnell for years, making headlines when her family’s company, Foremost Maritime Corporation, was caught trafficking 90 pounds of cocaine on a ship it was operating, the Ping May. We Are Change‘s Luke Rudkowski has previously reported on Trump’s choice for deputy national security adviser, K.T. McFarland, and her ties to Kissinger. The role of Secretary of Transportation could be hugely important under President Trump, considering his promise to spend $1 trillion on rebuilding U.S. infrastructure such as roads, bridges, and airports. With her history in the D.C. “swamp” and a husband who was far from a supporter of Donald Trump during the Republican primaries, the question remains – what is President-elect Trump’s motivation in hiring Elaine Chao? PreviousWill Nancy Pelosi Stay ‘Top Democrat’ In The House After Secret Ballot?